Right in the heart of a rare pine forest, with beautiful springs, little streams and magnificent gorges you may find the serenity you are looking for and also enjoy high class accommodation and warm hospitality. The “Pezoulia” Mountain Retreat is a complex of four independent units, built inside the Selakano settlement, close to the forest at an altitude of 930m. “Pezoulia” can become an ideal starting point for your daily excursions to the picturesque mountain area of Dikti, as well as trips to the fabulous south east beaches of Crete which are located only 15km from the settlement. 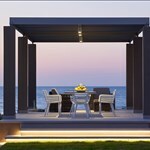 A dreamy destination in the heart of Crete, available for you all year long, ideal either for a cool summer vacation or a breathtaking winter experience. “Pezoulia” in the Cretan dialect is the word for steps. It also refers to the way the Cretan people make mountain areas with steep slopes suitable for cultivation and house building by creating several even levels on a slope, like steps on a stairs. Traditional Cretan Taverna with homemade food made from local produce is located with the Pezoulia Mountain Retreat. Ierapetra: Head outside the town of Ierapetra on the road to Gra Lygia . Take the right turn to Anatoli , continue towards Males and after passing the village of Males, look for the sign “Selakano”. Heraklio: Follow the road to Viannos and before reaching Myrtos, turn left to Mythous& Males. When you get to the village of Christos, turn right to Selakano. 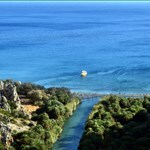 Agios Nikolaos: Take the road to Ierapetra. When you reach Kalo Horio, take the turn to Kalamafka, Anatoli& Males. When you reach the village of Christos turn right to Selakano. The whole area is always lush green and beautiful, ideal for trips and excursions throughout the year. It is also an excellent starting point as it is as close to Dikti’s mountain top, as to the fabulous southern beaches of Ierapetra. The people of the Selakano settlement – natives or owners of country houses in the area – are warm and friendly, relaxed and straightforward. They all meet in a small cafe – tavern owned by Styliani, enjoying her famous cooking and the shade of the vine in her yard. They are more than happy to meet with travelers, hikers and tourists and offer them at least a round of drinks or other treats. 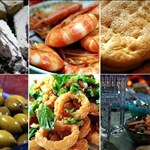 An authentic sample of Cretan hospitality and a glance in the Cretan way of life. Erodium Guesthouse can accommodate 2 to 4 persons. It is developed on two levels and equipped with every amenity someone might ask for. Erodium is one of the four houses of the Pezoulia Mountain Retreat.